Do you love your food and planning your first visit to Paris? Then a warm, tasty introduction to traditional French foods is a delicious way to start your trip. 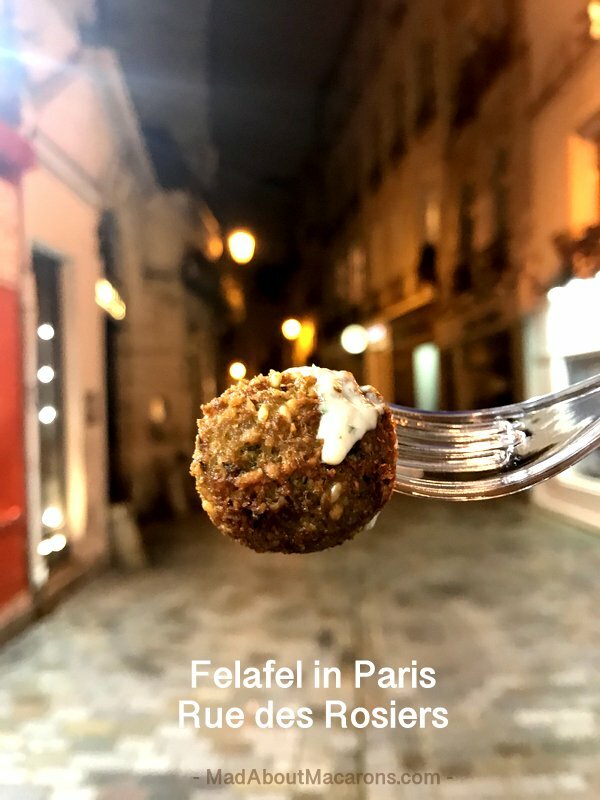 I recently discovered that The Paris Guy has an evening food tour, that’s quite literally the hottest Paris food tour in the Marais! While most walking Paris food tours focus on markets, ingredients, bread and cheese plus the sweeter side (like I used to lead in Saint Germain-des-Prés) on chocolates, pastries and macarons while walking, discussing and tasting in and between boutiques, Le Marais Paris Food Tour concentrates on primarily sit-down restaurant tastings of oysters and Champagne, wine, cheese, galettes (savoury crêpes) with cidre, Boeuf Bourguignon, more wine and crème brûlée – and that’s not all. 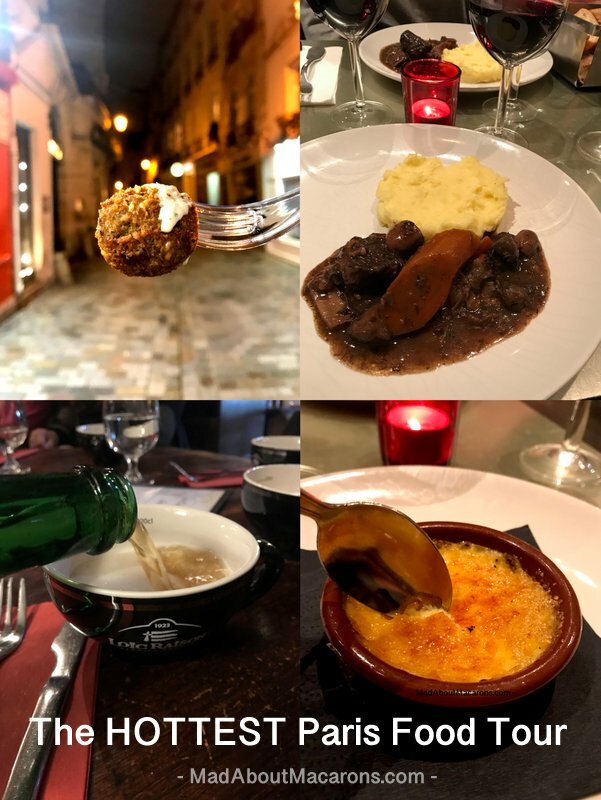 Thank you to the Paris Guy for sponsoring this post by inviting me to experience Le Marais Paris Food tour. As always, all opinions are entirely my own. 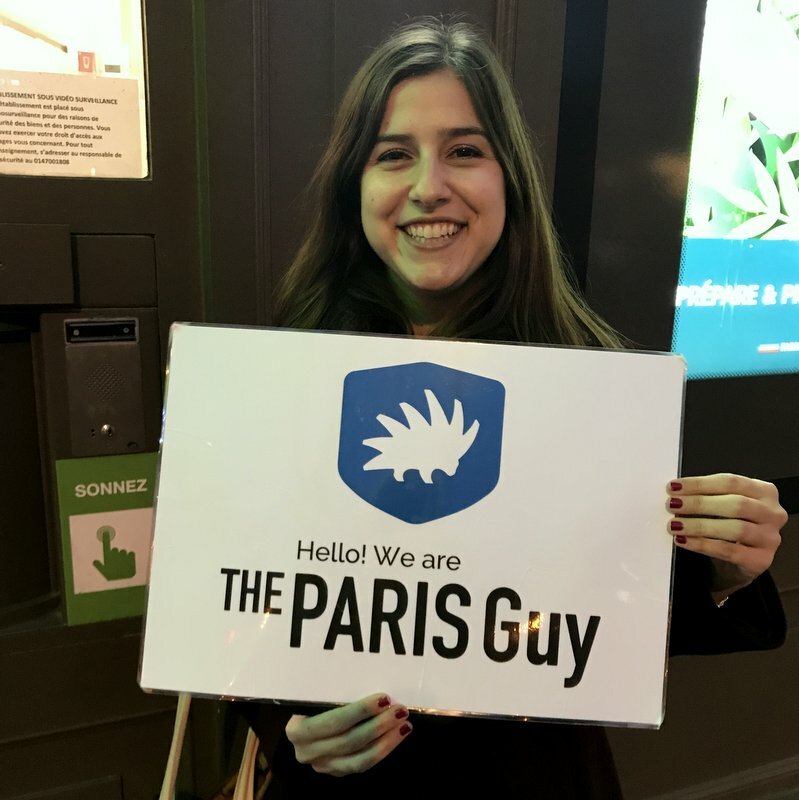 Affiliate links are included in this post, as The Paris Guy has kindly offered my readers 5% off their tours in Paris if you use the unique code, MADABOUTMACARONS. The Hottest Paris Food Tour in the Marais kicks off with a warm welcome early evening near the metro, République. Our English-speaking guide for the 3-hour walking tour was Erica. Our group was made up of a maximum of 12 so, along with the food tastings, anecdotes and history thrown in, it ended up being a fun social evening too. To get us in the French mood, the POP sounded as our bottle of Champagne was opened with some explanations on the French’s famous bubbly. Platters of N°4 and N°3 oysters arrived in this lovely seafood bar. If you follow me on Instagram, you’ll see I love flowers and so this was a perfect spot to appreciate them too. A touch of smoked salted butter served with the most delicious bread is delicious – but be careful: go easy on the bread in the initial stages, as you need to pace yourself on this food tour! There’s still more to come. Sipping on Champagne, I also loved the refreshing minty touch to their carafe water. If you know me, however, I usually prefer more Champagne than grabbing (or “crab-bing”) that bottle of water! See anemones at the Parisian seafood bar? 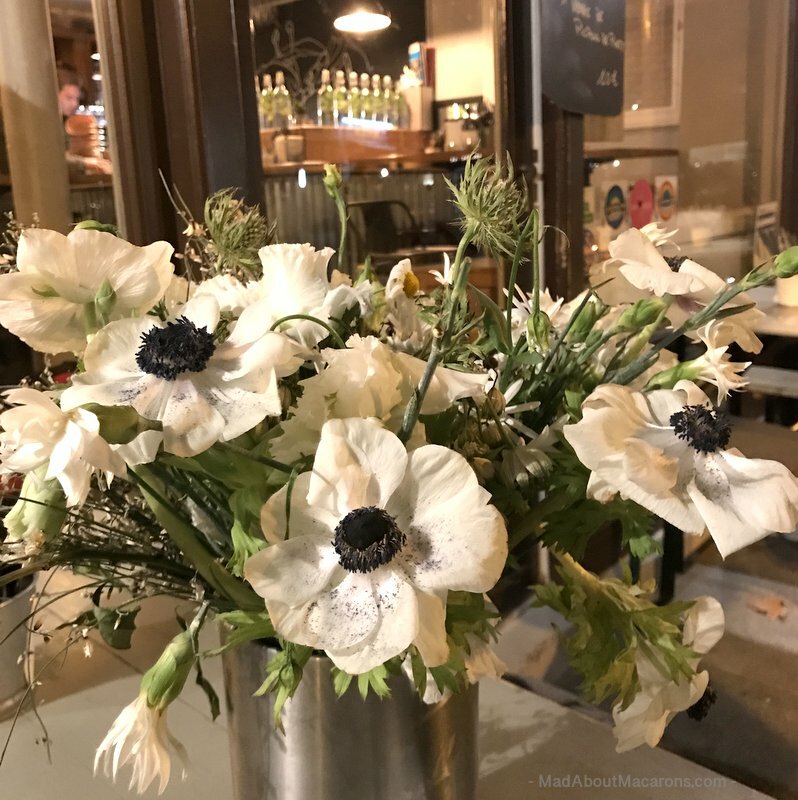 See Anemones in front of this seafood bar in the Marais? Say Cheese – French Fromage! Normally the Paris Guy Food Tour starts with the Oyster tasting with Champagne but exceptionally, as it hadn’t yet opened at our meeting time, we started with the cheese. With over 1000 cheeses in France, no savoury tour is complete without it! I’ll leave you to discover the cheesy stories and tips on the tour but the tasting platter had a good variety of many of my personal favourites. If you’re a couple, ensure you both have a taste of the stronger types together (just saying…), absolutely delicious served with fig jam (see my Corsican fig jam recipe here). 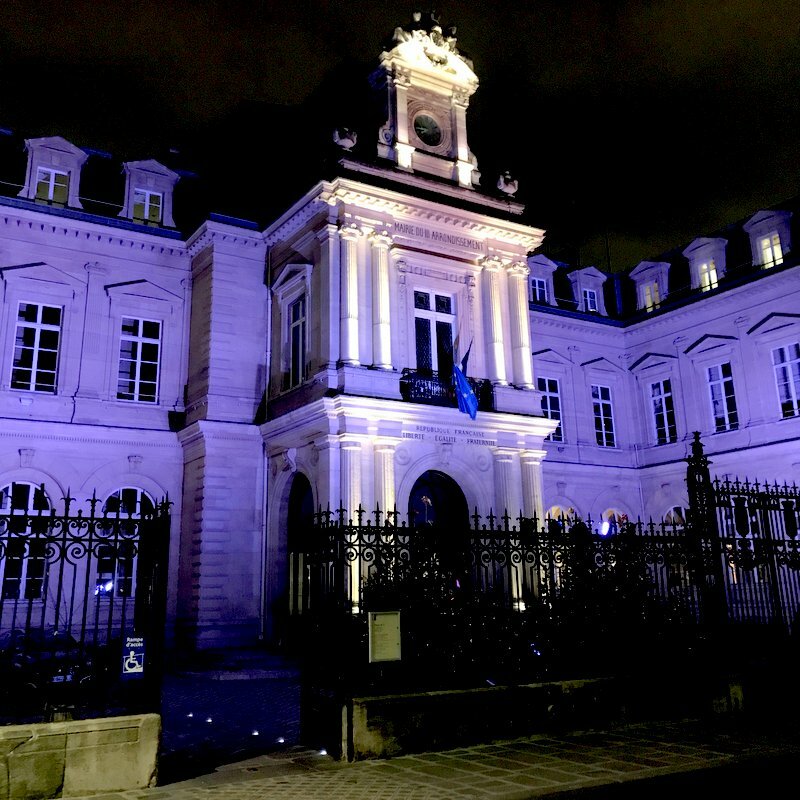 Walking past many landmarks in the Marais, such as the Mairie of the 3rd arrondissement above, we headed for the famous rue des Rosiers in the Jewish quarter. The speciality? Falafel. Falafels, deep-fried chickpea balls, are one of those deliciously “Did you know that they’re vegan?” types of foods that we enjoyed outside (the only tasting outdoors on the tour), with finger-licking sesame sauce coupled with a vibrant, festive ambience. Next up on the tour was a walk to a cosy Crêperie. 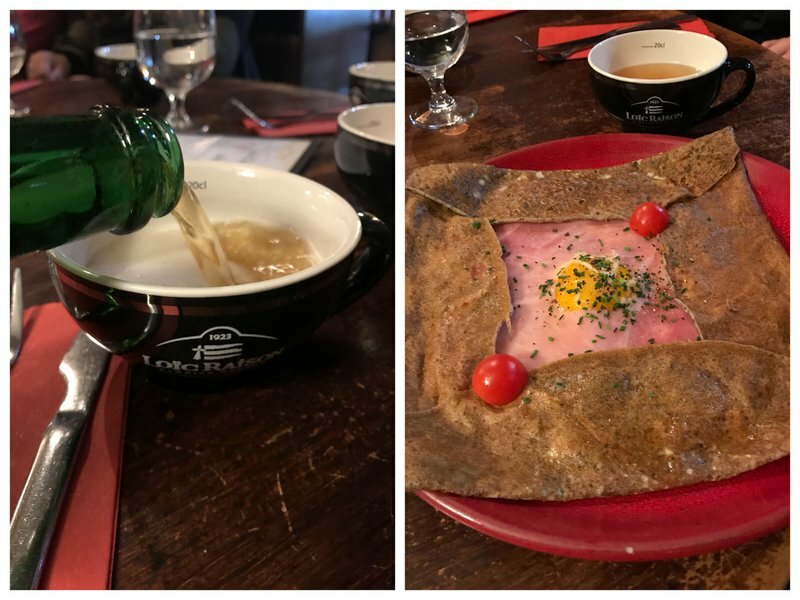 Typically served in Brittany and in Normandy, traditional wafer-thin buckwheat galettes – savoury crêpes – are enjoyed with cider served in giant cups. We tasted a couple of varieties: Forestière (chicken and mushroom) and the popular Complète with ham, cheese and egg washed down with some Cidre Brut. I did tell you you need to pace yourself! Our last stop was a most relaxed setting in a quiet, slightly hidden Parisian Brasserie for not one but TWO finale tastings. 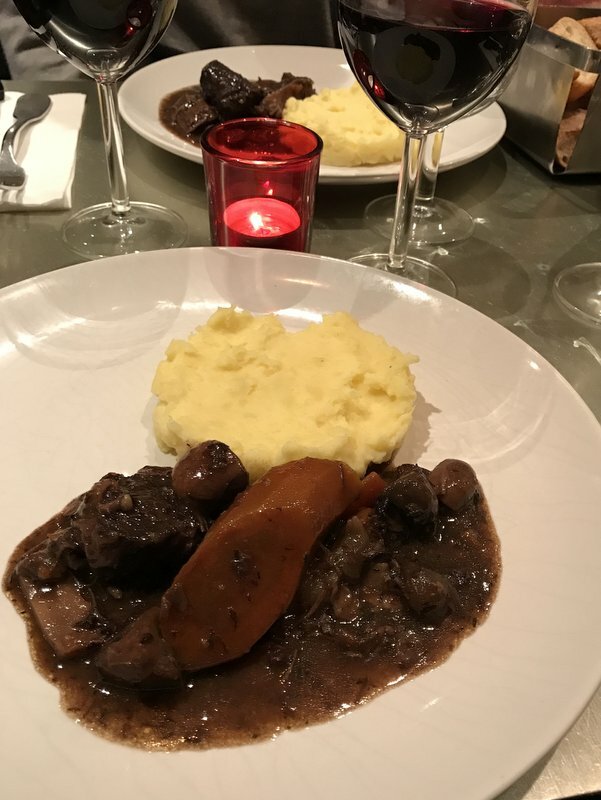 As more wine was served, so was a generous tasting of Boeuf Bourguignon, a typical hearty beef stew from Burgundy, slowly cooked with mushrooms and carrots in Burgundy wine. Served with purée (also wonderful with Gratin Dauphinois), this is the ultimate French comfort food. This is when Amelie Poulin would adore coming here too. 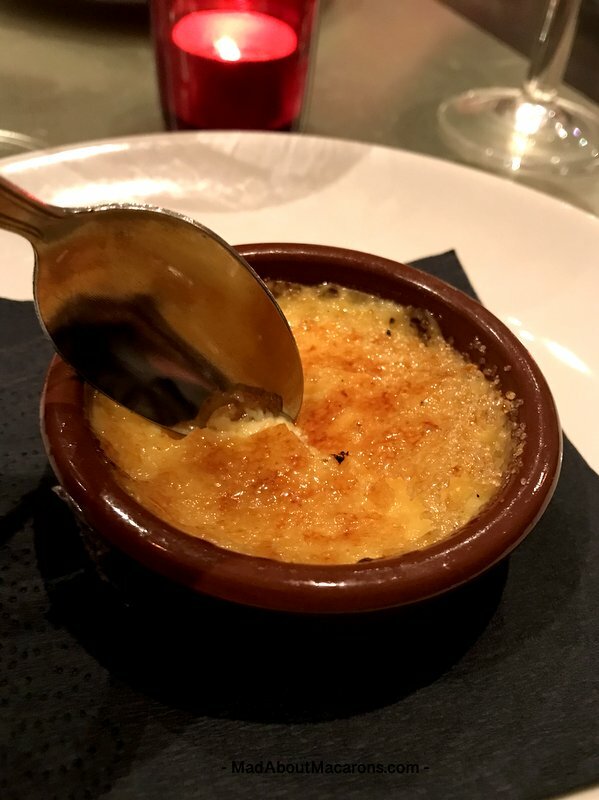 Her favourite part of this Parisian dessert, crème brûlée, is cracking the burned sugar surface and discovering the eggy vanilla cream underneath. Incidentally, I have a recipe for a milk chocolate crème brûlée here. As we said Au Revoir to Erica, our cheerful Paris Guy guide, Paris by Night awaited outside. 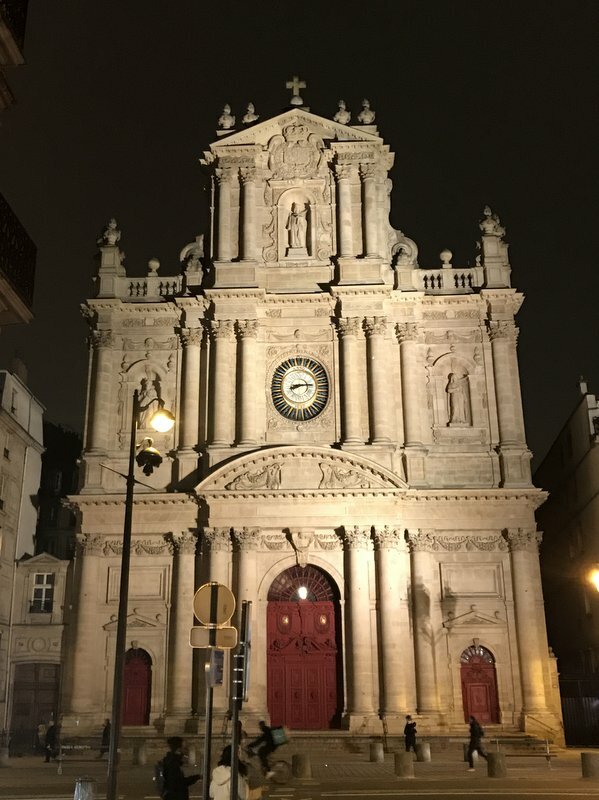 The 17th Century Eglise Saint-Paul-Saint-Louis was glistening in all its glory before heading back into the metro home on rue St Antoine. Hottest Paris Food Tour – 5% Reader Discount! Looking to try traditional French food in Paris on your first trip? Prefer to sit more in restaurants than mainly eat outside? 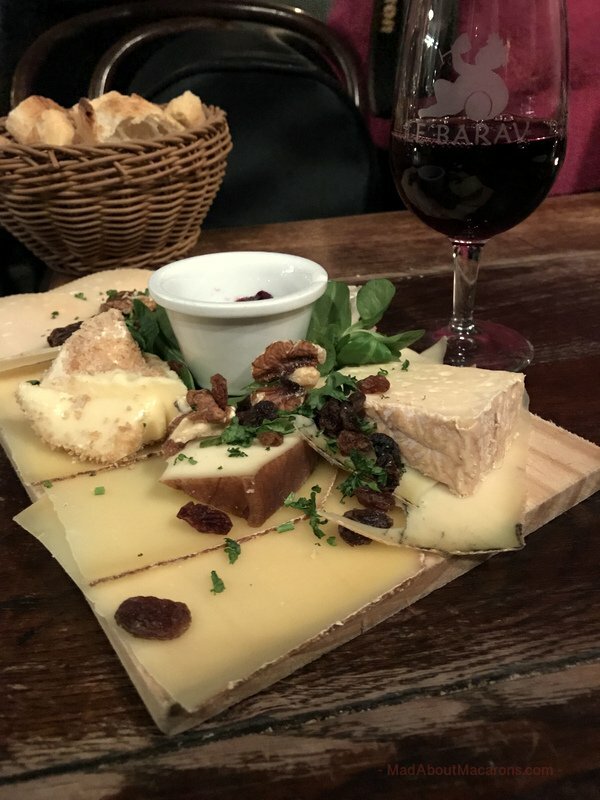 Then this is the ideal evening walking tour – indeed, literally the hottest Paris food tour for couples, solo travellers, families with older children and amongst friends – and great as gifts too if friends or family are going to Paris! 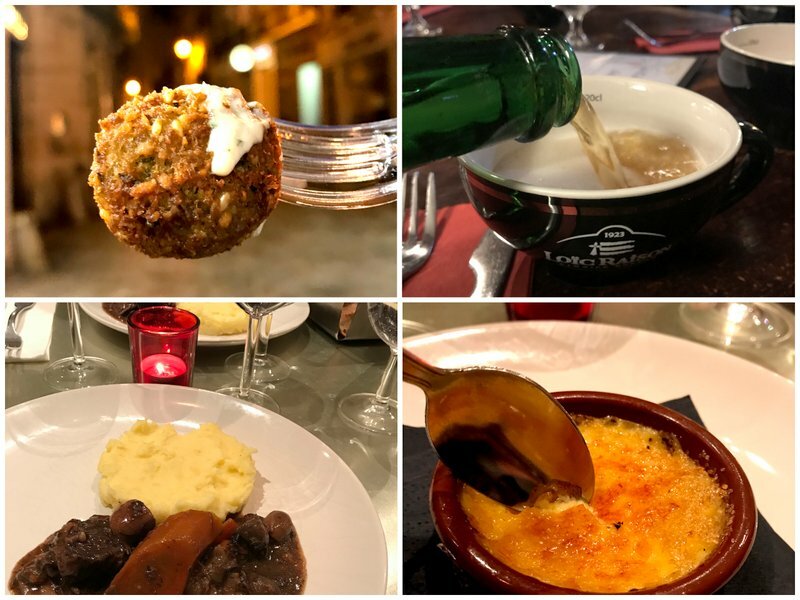 Disclosure: Thank you to the Paris Guy for sponsoring this post by inviting me to experience their Le Marais Paris Food tour. As always, all opinions are entirely my own. Affiliate links are included in this post, as the Paris Guy has kindly offered my readers 5% off their tours in Paris if you use the unique code, MADABOUTMACARONS (also includes their tours in Italy). Mention meal delivery and my clichéd image to date has been of oversized plastic containers on the back of screeching mopeds, risking life and limb to get extra fast food delivered – often with the contents merging in to its carton box and arriving just as soggy as the deliverer. So imagine my surprise when I discovered quite the opposite: a rather secret French gourmet meal delivery service in our neighbourhood, just west of Paris. Monsieur Fine Bouche delivers freshly-prepared top quality restaurant meals at the perfect temperature using locally sourced fresh ingredients, direct to your doorstep (see zones near Paris*) within just 40 minutes by a chic waiter in a black suit. 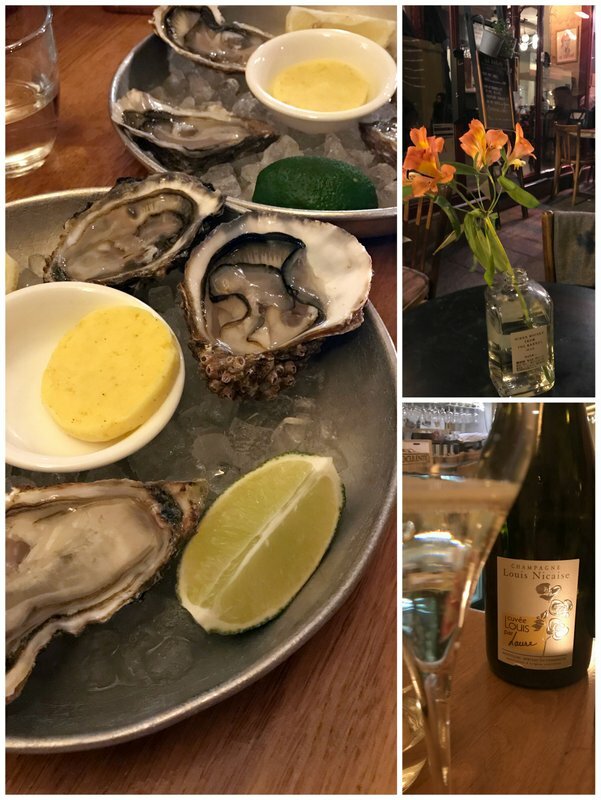 I was thrilled to be invited along with my real-life Instagram friend, Geni Mermoud, to taste a 3-course menu of my choice from Monsieur Fine Bouche’s website, with each separate menu item prepared directly in front of us by jovial Chef Alexis Jordan at their impeccable kitchen in Saint-Germain-en-Laye. It’s just like a restaurant, except the clients are either at home, at work, in a park – just an astonishing 40 minutes’ away from receiving their meal after passing an order. The choice of dishes change according to season but Chef Jordan continues his signature dishes, of which I tried two of them. 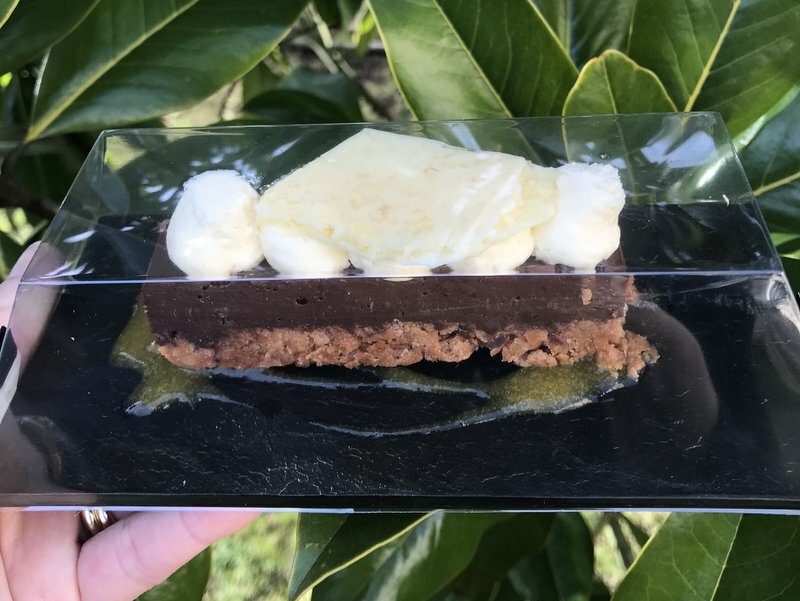 There’s something for every taste: from healthy starters (entrées), mains (les plats), sides, salads, cheese or charcuterie platters, desserts, childrens’ menu options, and meals low in calories for those watching their weight. 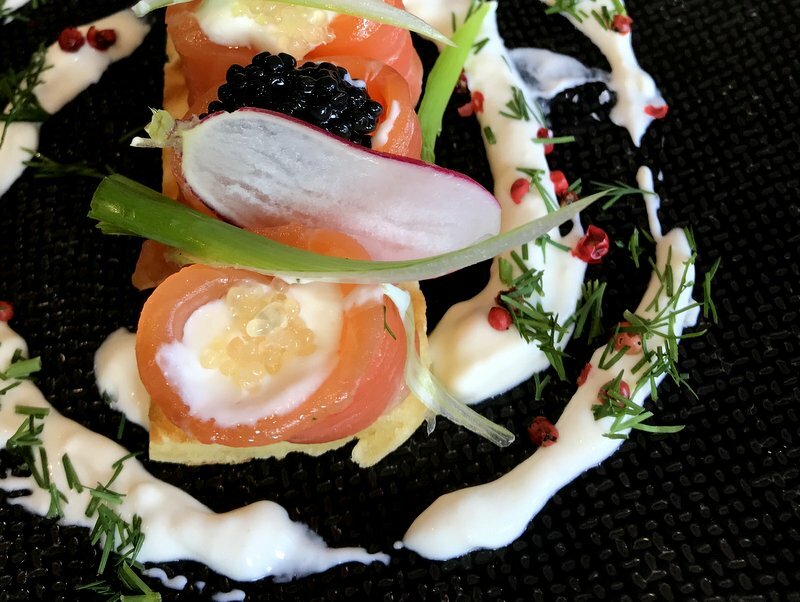 The Signature starter dish, Salmon Gravlax with citrus caviar was a meal in itself. 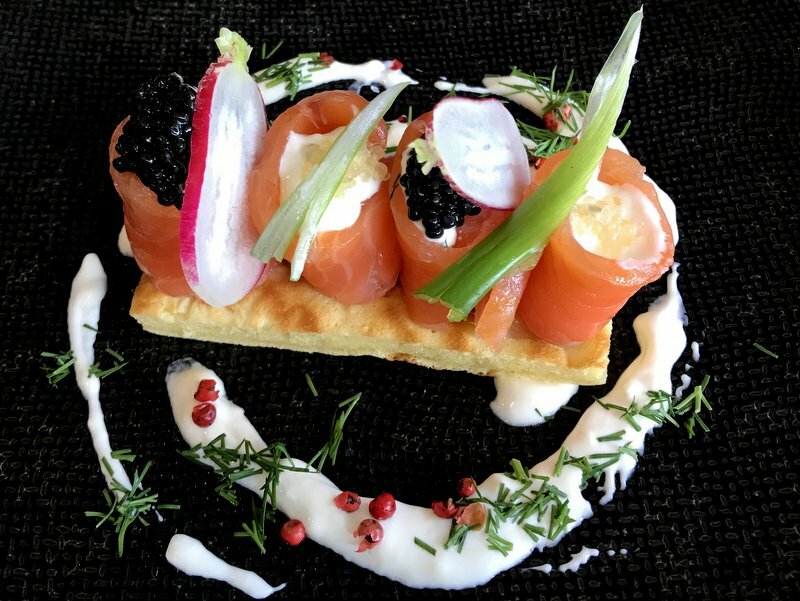 The salmon was extra succulent, marinated in coarse sea salt and dill, then plated beautifully on top of a waffle with a refinement you’d get in a French restaurant – if not more. 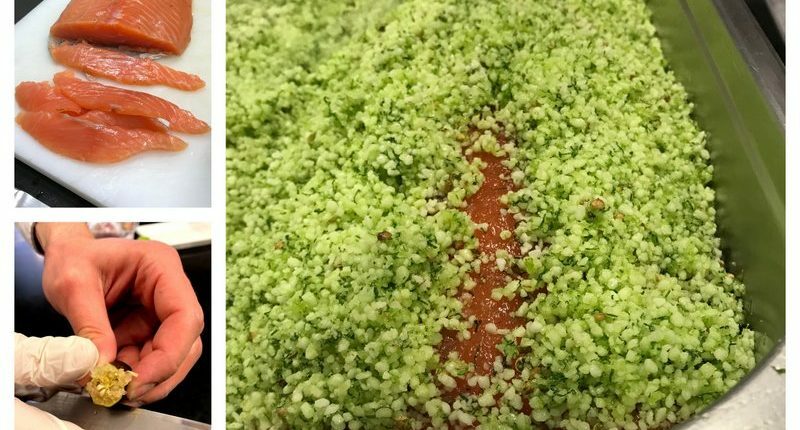 Quite honestly, I’ve been surprisingly disappointed in some Parisian restaurants when a couple of slices of salmon arrives thrown on a plate with a wedge of lemon and tickly toupée of dill on the side – something we could easily do at home. Instead, this arrives already plated with the citrus caviar a subtle, extra je ne sais quoi taking the dish to another level along with its bells and whistles. It’s not just the food we found top notch: they’ve taken their delivery operations to the next level using high-tech gadgets (including car batteries, thermometers, and special ovens) so that the food arrives at the perfect temperature. You ordered a medium-rare steak? It arrives via their delivery cars cooked to perfection, just as it was prepared in their restaurant-style kitchen. They’ve also cleverly sourced the containers so that the meal comes as close as possible to serving each dish as it would be prepared in a restaurant. With asparagus season in full swing, sourced from the Ferme de Nangeville in the Central Loire, there are a few dishes to get asparagused. 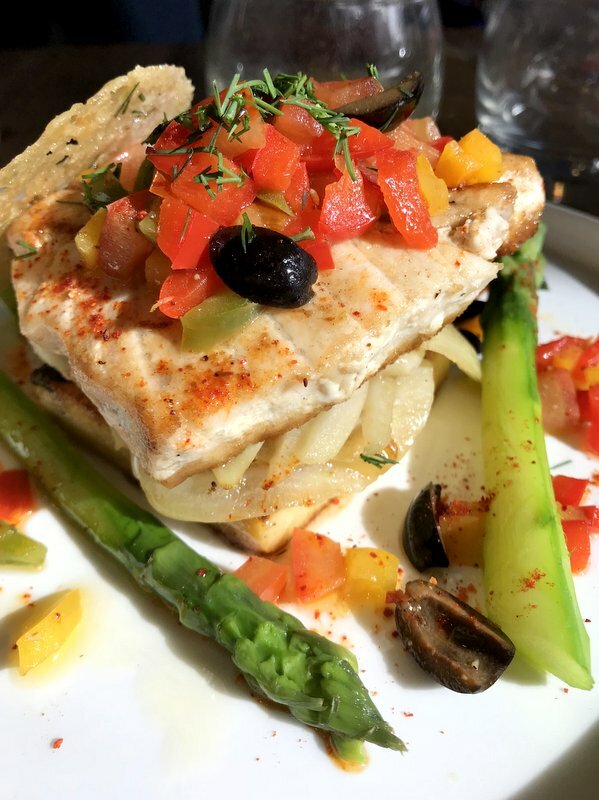 Fish dishes vary but this swordfish (espadon) was melt-in-the-mouth, served with a parmesan tuile, on a bed of polenta, roasted fennel and topped with sunny Provençal vegetables. Geni went for the most tender lamb, that just fell off the bone. You can, however, ask for dishes to arrive unheated, so that you can do the rest at home (I thought of this as a sneaky cheats’ way, making guests think you cooked the dishes yourself!). Precise re-heating instructions are personally adapted for each dish, depending on your oven at home. They prefer using a warm oven at around 120°C for, say 20 minutes, than to blasting the whole lot in the microwave, though! To be honest, I couldn’t even manage dessert at lunchtime and so, in true Monsieur Fine Bouche style, I took home Chef Jordan’s signature dessert, packaged neatly for my picnic later: La Feuillantine of 2 Chocolates and Passion Fruit with crunchy praline, topped with a white chocolate surprise including crackling sugar (sucre pétillant). It’s how I love my dessert: not too sweet, light and with layers of different textures. Divine! Main dishes range from €17 to €23 and a gourmet Signature Menu comes at €35, including an artisanal fresh fruit juice from Alain Milliat. Even their gourmet water options are well sourced: Saint Géron sparkling and – for those of you who like to name-drop at the table, the still water is served at the Matignon – Treignac from the Corrèze. 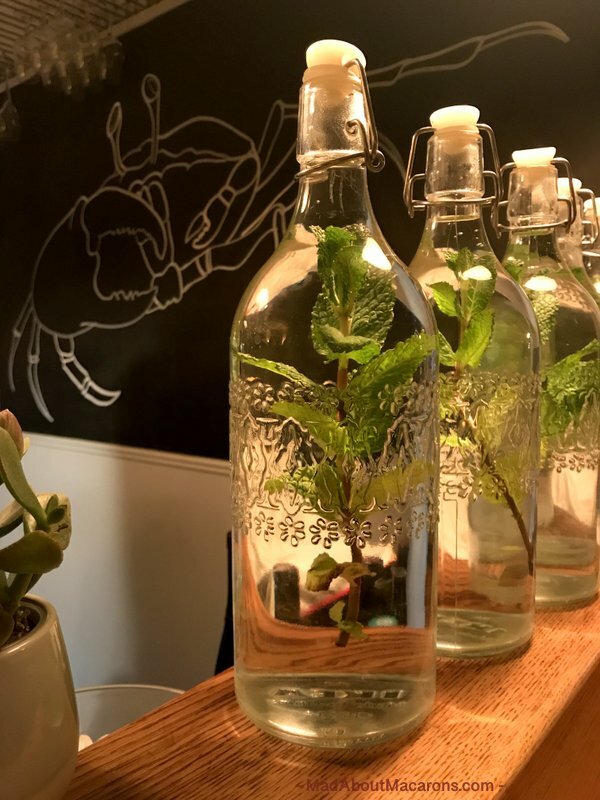 Although they have options of French wine and Champagne, the beauty is to have a restaurant-standard meal at home with your own bottle – although their new Mojito cocktails do look rather tempting. Also great for business lunches – they even accept ticket-restaurant lunch vouchers. Saint-Germain-en-Laye, Poissy, Chambourcy, Fourqueux, Mareil-Marly, Marly-le-Roi, L’Etang-la-ville, Le Pecq, Le Vésinet, Chatou, Le Port-Marly. Personally, I don’t need a chic-looking waiter to deliver: what matters is the quality of the food – all beautifully homemade – and delivery. Value for money is excellent, and with delicious variety to their choice of seasonal dishes. How they manage to deliver to your door with dishes plated with such care and cooked to perfection is simply genius. 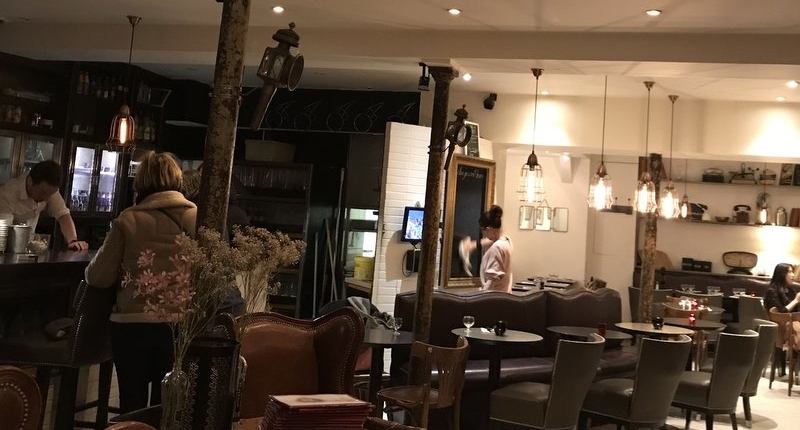 It’s impressive how big a zone they cover in this area and totally in love with their concept of a French gourmet meal delivered direct to you in 40 minutes after just a few clicks – it’s just enough time to get the wine organised, and even then they’ve got you covered! Just mention MadAboutMacarons and receive €10 off your first delivery! Disclaimer Note: I was not compensated for this post but invited to taste a typical menu. All opinions, as usual, are entirely my own. Although not required to be positive, I’m sharing this as I believe in the quality on offer to my readers. Every home baker needs the right tools for successful baking. I’m not talking unnecessary fancy expensive gadgets, but straightforward inexpensive quality equipment that’s both compact and easy to use. 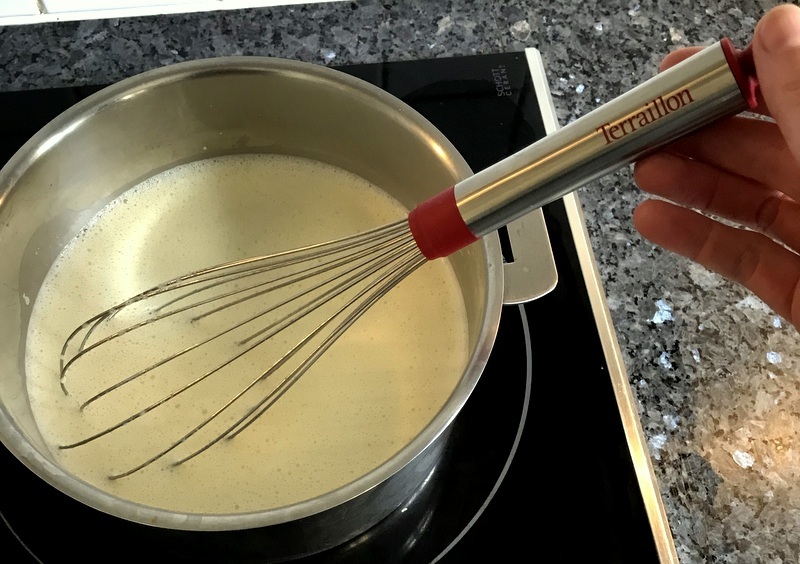 For the past couple of months, I’ve enjoyed testing Terraillon’s essential baking utensils for this review. You may have seen me (via Instagram, live stories) baking constantly over weekends and many weeknights, making tarts, macarons, financiers, ice cream, and more recipes from my latest book, Teatime in Paris, just to fully put them to the test. To date, I’ve been most impressed with the digital scales from the macaron range. If you don’t use digital scales to measure your ingredients for baking, then please read this article NOW. Please avoid using cups: weighing your ingredients exactly by grams (or ounces) will not just give you successful results – but consistently successful baking results. Let’s start with this clever new mixing bowl kit. As with all Terraillon’s baking utensils range, it’s approved by Christophe Michalak, one of France’s most prestigious star pastry chefs. As they say, Express Your Chef! 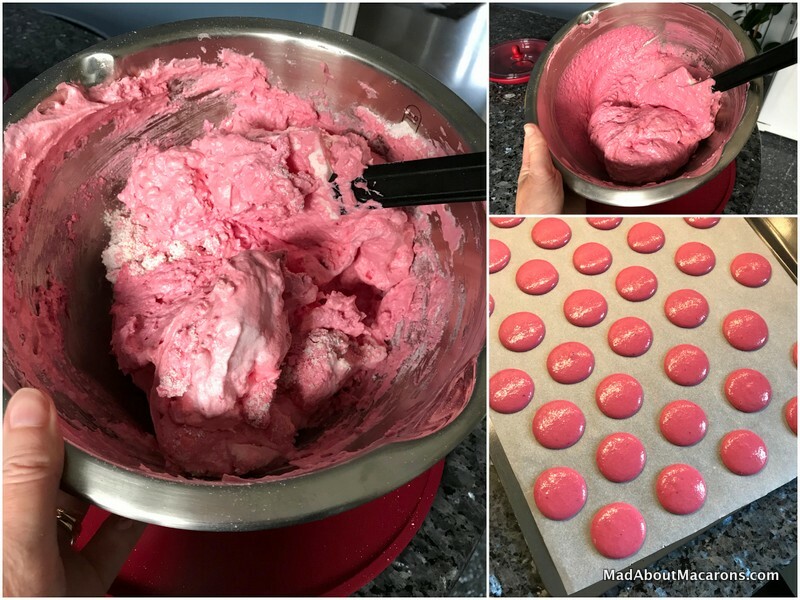 Stainless steel bowls are essential tools and this mixing bowl is a dream for making macarons, particularly as it’s slightly heavier than my current ones. As a result, there’s more control in mixing the batter (macaronnage) and placed on its non slip support, I can turn it around effortlessly and securely while mixing. Without this support, I’ve been known to zealously whisk using a super light bowl with the bowl finally flying in the air and batter on the floor! It’s not possible with this, rest assured. 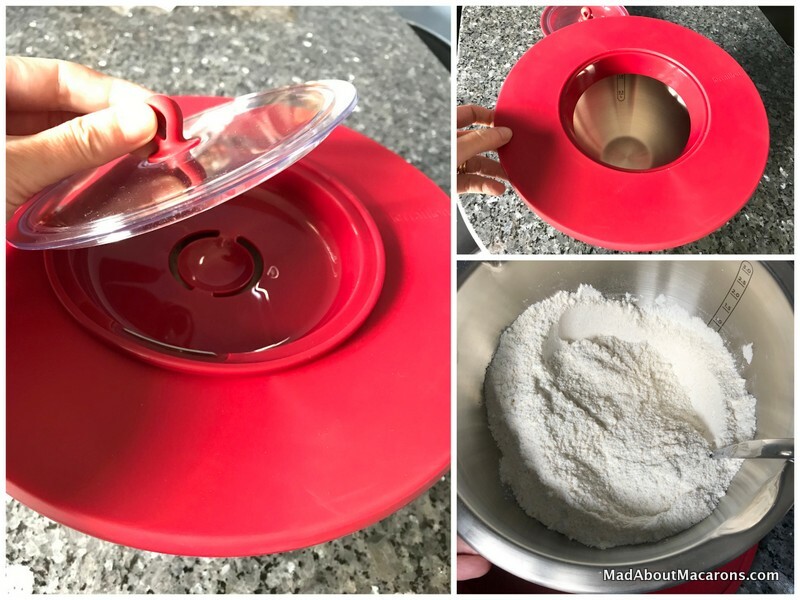 The non slip support has a dual function, as an anti-splatter lid – and I’ve found it conveniently fits on all my other bowls in the kitchen. It’s ideal for mixing up cookie dough, mousses or meringue without the splatter that can be caused using an electric whisk. This microwavable silicone bowl is handy for directly catching the egg whites from the separator: put the lid on and store in the fridge for about 3 days if you’re making macarons. It’s also great for gently melting butter or chocolate directly in the microwave. Although it didn’t fit my own smaller saucepan, it’s ideal for melting chocolate over a pan of simmering water (bain-marie) and I’ve used it for preparing ganache fillings for macarons and Tigré (financier) French cakes. It’s also handy for storing leftover batter or ganaches with the lid on in the fridge – it’s currently sitting neatly in my fridge with a savoury crumble mix. The Premium Tall Whisk is part of the hand tools collection. I already have 3 whisks that are used constantly for making smooth sauces, silky pastry creams, ice cream, etc. and so they take a beating. 2.5 out of 3 are already deformed and frankly, not good quality. On the other hand, this tall whisk is very slightly heavier and at 35cm, with its comfortable ergonomic stainless steel handle with stainless steel arms, is sturdy and robust for continued easy whisking. I find it bounces along beautifully and copes well with the thicker sauces or custards, and I love the comfortable length. The silicone ring makes it easy to hang up too. As with the rest of the Terraillon baking equipment, it’s dishwasher-safe. Yet another ingenious space-saving innovation is Terraillon’s rolling pin and pastry mat set. 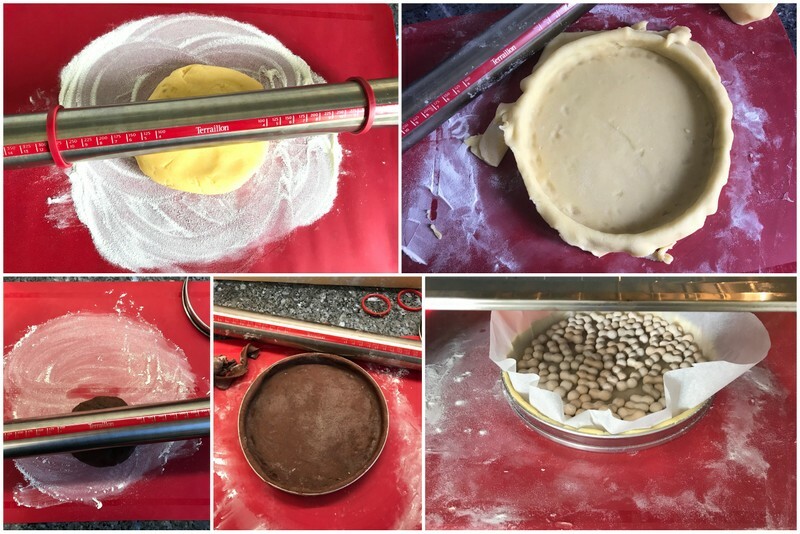 It’s just as compact: the pastry mat is neatly rolled inside the rolling pin tube, closed at the end of the tube with a silicone cookie cutter. It’s a 2-in-1 mat (47.8 x 38cm) that’s graduated for precision to fit your tart rings/pans and – wait for it – goes DIRECTLY IN THE OVEN, withstanding temperatures up to 220°C/425°F/Gas 7. 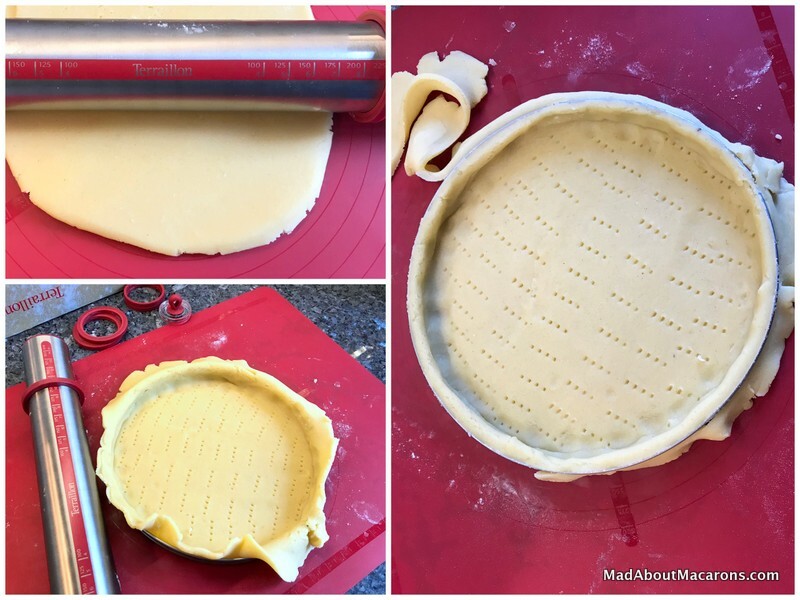 This is particularly useful when using tart rings, for example, as once you’ve rolled out your pastry and pressed it neatly into the ring, it’s so much easier to keep it directly on the mat and place in the oven. No transferring to the oven sheet is necessary: just slip the baking sheet under the mat. I also find the mat washes well and, unlike other mats I’ve tried, it dries quickly and doesn’t leave a greasy film on it. Once cleaned, it’s easy to roll it up neatly with the elastic and pop it back in the rolling pin tube. How can you define the best kind of professional standard rolling pin? It’s pretty subjective as some of us may prefer handles but after trying this rolling pin, I’m not going back to my old ones with wooden handles. For a start, it has a lovely length of 42cm and as it’s lightweight, just glides smoothly without the stickiness on the pastry dough. Its precise graduations and 3 pairs of removable rings allows you to adjust the thickness of your dough: 4mm, 6mm or 8mm, making your pastry beautifully even. For tart and tartlet recipes, enjoy this chestnut flour, pumpkin and pecan tart. Another essential item for the home baker? You’ll need my book, Teatime in Paris! 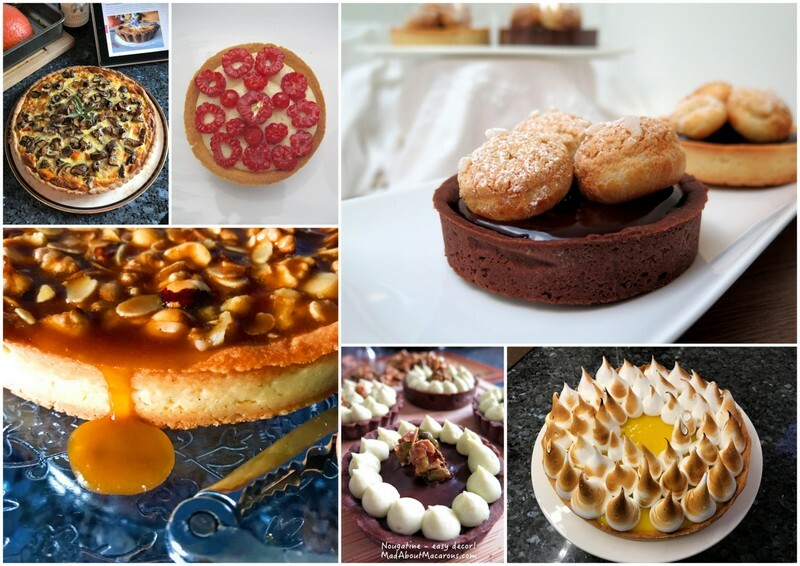 As well as recipes for more macarons, éclairs, millefeuilles, ice cream, teacakes etc. there are also detailed instructions on how to make the perfect tart pastry (including chocolate) in the tart recipe chapter. Sorry but this Giveaway is now closed. 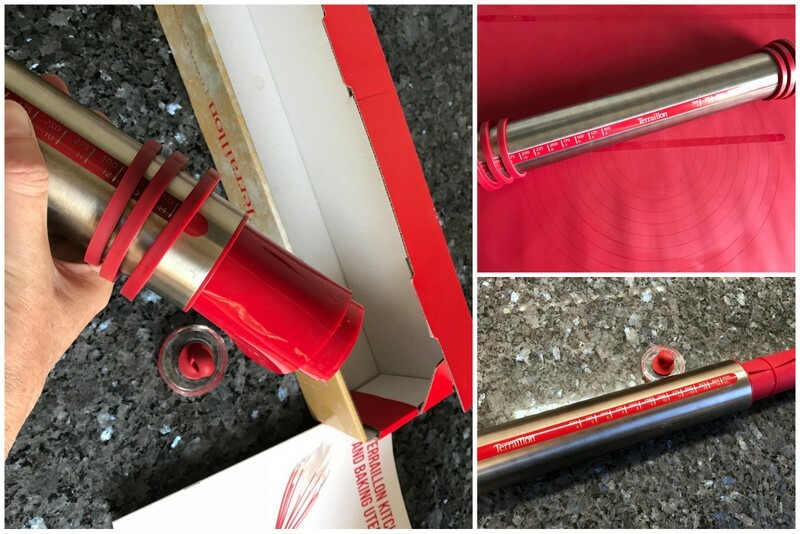 The baking utensils experts at Terraillon have kindly given away the Rolling Pin & Pastry Mat Set (value of £34.99) to one of the lucky readers in the UK who entered with their comments below: Congratulations to Suzanne! Thanks to all of you who entered. The Giveaway is over, but the products continue – both the Rolling Pin & Pastry Mat Set and the Rolling Pin & Pastry Mat Set are available on Amazon.co.uk. Leave a comment below, saying how you would “Express your Chef” with Terraillon’s rolling pin and pastry mat and why you think it’s one of the most essential baking utensils. 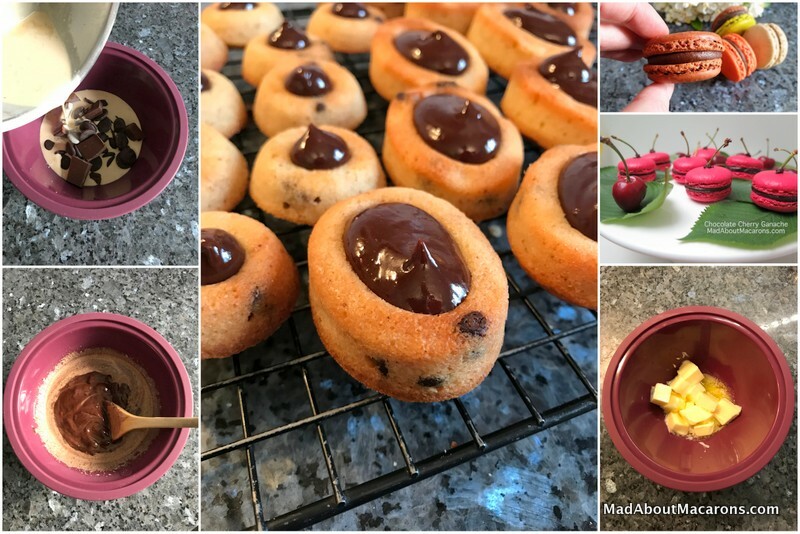 Disclaimer: I was not compensated for this post and was given the above new baking equipment from Terraillon UK for the purpose of a review. I was not required to be positive and, as always, all opinions are my own. Links to Amazon are not affiliate links.